This Wired Trilby pendant light presents a circular shape with thin layers of aluminium wrapping around to complete the shape. It has an industrial, contemporary appearance and is present day. It looks great anywhere in your home, office, stairwell, or even in a commercial environment. 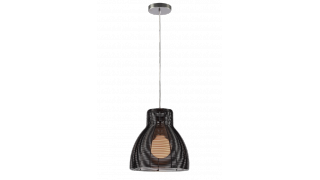 The long cable length allows you suspend the light at different heights from the ceiling giving you many different looks. This light oozes class and looks fantastic in any situation. Just use your imagination and try different approaches to obtain different looks.